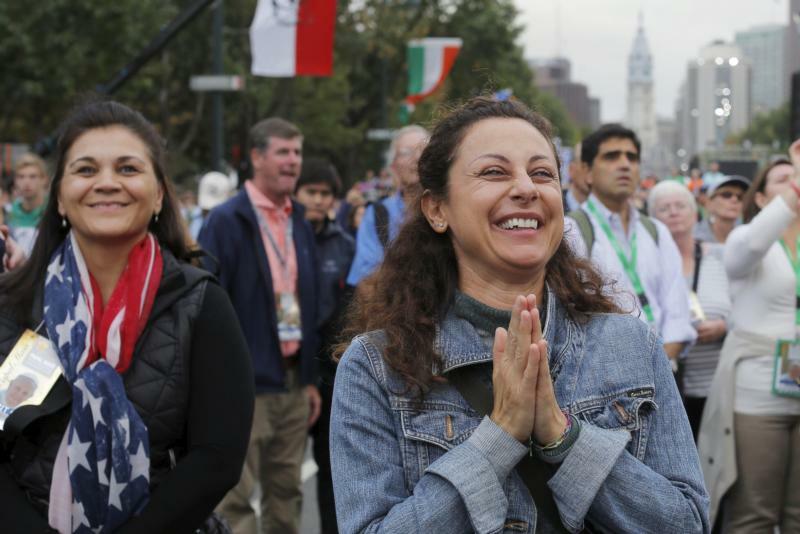 PHILADELPHIA (CNS) — It’s difficult to forget Pope Francis’ passionate Sept. 26 speech, his gestures and the tone of his voice when he addressed the value of the family in Philadelphia. A “society grows strong, grows in goodness, grows in beauty and truly grows if it is built on the foundation of the family,” said the pope, addressing the Festival of Families on the city’s Benjamin Franklin Parkway that Saturday evening. It is the passion shown that evening that many hope will drive the upcoming Synod of Bishops on the family set for Oct. 4-25 in Rome. It’s not about hiding the problems families face, Msgr. da Cunha said. After all, the pope publicly admitted in that same speech that while the family is beautiful, it is difficult. “But it’s worth fighting for the family,” said Msgr. da Cunha. And for clergy, religious, and all those who attend the three-week synod, it is about something more than just defending a small group of people. It is about defending society itself. Society is about being in communion with others, said Msgr. da Cunha. In that sense, all that the pope has addressed, including war and the environment, is tied to that communion, he added. The culture of individualism is really a problem in some societies, especially those that learn to value the material and not people, he said. “No one can experience happiness of the fullness of life if (he or she) is alone,” he said. That doesn’t mean that the person necessarily needs to have a family but if one has been part of a family, that person can understand love, sacrifice for the common good of others. A parish can serve as a place for the creation of family, a sense of belonging, where even “one person alone is welcome,” he said. But if people don’t have a network of family and friends, they may have what they need materially but it’s very hard to find happiness in that, he said. “Sometimes the parish has a family structure and is place you feel loved,” he said. In Cuba, Maria del Carmen Zellek Camayd, said that in a society where Catholics have undergone periods of persecution and social difficulty, the parish helped her deal with what was happening to those of her faith in an atheistic nation but to also to deal with personal travails that included a childless marriage that dissolved. However, children from her parish on the eastern end of the island have become like her nieces and nephews, and visits from other parishioners with whom she has shared difficult, but also happy times, helped them become a different type of family — one rooted in the spiritual but also in a social community. It is this type of love that Msgr. da Cunha refers to and it is one that can help other societies dealing with challenges, such as the recent wave of refugees fleeing war and other societal ills. The church can and has helped them pastorally, helping those who are poor, sometimes helping alleviate some of the materially problems, or to advocate for them with governments and politicians, Msgr. da Cunha said. When seen from the point of view of a society of communities and not from the point of view of an individual, problems or challenges — such as war, the environment, migration — have solutions, he said. “Everything is different if you see these in society, through the experience of love, of this family,” he said.